Quantum physics seems weird at first – things can be at more than one place at the same time, observation changes the observed object, nothing can be predicted with certainty. It describes with great success the world of the ultrasmall – single particles and indivisible units of light and radiation. This is why we find it unusual, it is a world we do not see in our daily lives, so we do not have an intuition for it at first. Yet, it can be understood and modeled and it turns out that the predictions of quantum physics are true. Quantum technologies are turning this aspect around – what if we use the understanding of quantum physics in order to build new and exciting applications? What if our computer programs can look at many pieces of data at the same time, what if we can rebuild a chemical reaction on a computer to understand how to use it better? What if we uncover eavesdroppers in secure communication because they leave a trace when they observe our data? What if we take sensing to the limit of resolution that the laws of nature allows? All of these applications are existing at least as prototypes in laboratories today and are waiting to be turned into applications that benefit all of us. This is the second quantum revolution! You have seen the first, where some concepts of quantum physics already provide us with everyday devices. In fact, you probably have used them before such as lasers, if you are injured you are happy to have them applied to you such as resonance imaging systems, and you probably have billions of them in your pocket, such as the transistors on the computer chip in your phone. That’s the first quantum revolution, stay tuned for part two. Quantum computers will make enormous computing power available to solve certain problem classes. They are built from “quantum bits” (individual atoms, ions, photons or quantum electronic circuits) and exploit superposition and entanglement, to solve problems we could never solve otherwise. That includes, for example, processing vast amounts of data faster than ever before to search databases, solve equations, and recognise patterns. They may even have the potential to train artificial intelligence systems, e.g. for digital assistants that help doctors to diagnose diseases and suggest the most promising therapy, or to optimise the routes of all cars in a city simultaneously to avoid traffic jams and reduce emissions. Closely related to quantum computers are quantum simulators. They will be key to the design of new chemicals, from drugs to fertilisers for future medicine and agriculture, and of new materials, such as high-temperature superconductors for energy distribution without losses. Closely related to quantum computers are quantum simulators. They will be key to the design of new chemicals, from drugs to fertilisers for future medicine and agriculture, and of new materials, such as high-temperature superconductors for energy distribution without losses. Some quantum simulators are specialised quantum computers. Others imitate the idea of a wind tunnel: while there, small models are used to understand the aerodynamics cars or planes, some quantum simulators use simple model quantum systems (such as an array of single atoms) to understand systems that would be even more difficult to experiment with. Quantum communication will help protect the increasing amounts of citizens’ data transmitted digitally, for instance health records and financial transactions. A typical implementation of quantum networks uses single photons. If anything intercepts a single photon it will be noticed, meaning that with quantum technology we can achieve the most secure form of communication known, impossible to intercept without detection. For point-to-point communication, this is already on the market today and will be developed further into a quantum internet. Besides Quantum Communication, Quantum sensors will arguably be the basis for the first applications of Quantum Technologies. They provide the most accurate measurements and will drastically increase the performance of consumer devices and services, from medical diagnostics and imaging to high-precision navigation, to future applications in the Internet of Things. Quantum sensors use similar technologies as quantum computers and networks: they detect the tiniest disturbances because they are based on e.g., single electrons, the smallest possible charges and magnets. Quantum metrology uses quantum sensors to define the standards for e.g. time-keeping or electrical measurements. Quantum objects are often in a superposition of several states. In a photon, for example, the polarization directions of the light field overlap, here we call them H (horizontal) and V (vertical). The special thing about a superposition of H and V is that nature only decides on one of the two states during a measurement, and this completely randomly. Until then they exist “simultaneously” so to speak. 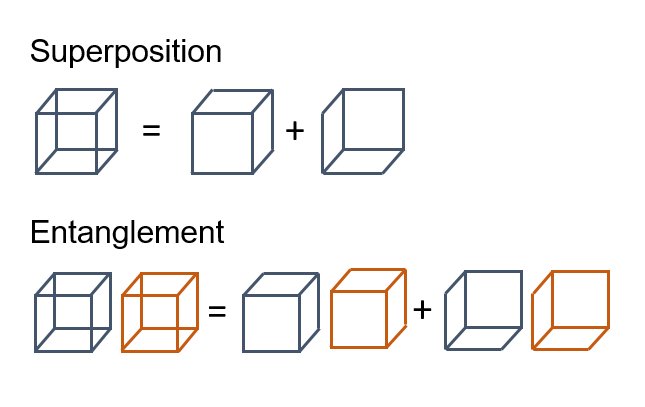 The concept of superposition can also be extended to several particles and is then called entanglement – the two terms often lead to confusion, since they describe the same phenomenon in essence. If, for example, two photons 1 and 2 are combined in a superposition H1H2+ V1V2, one will find either both horizontally polarised (state H1H2) or both vertically polarised (state V1V2), but never in opposite polarisation. Alternatively, of course, one could also prepare an anti-correlated combination H1V2+V1H2 and then always find the two light particles in different polarisation. It is impossible for the experimenter to predict which of the two measurement results will occur. Even if the measurements are carried out exactly at the same time at distant locations, thus excluding the possibility that one measurement may have influenced the other (since this would require an interaction faster than the speed of light, which is not possible according to the theory of relativity), this result is valid.